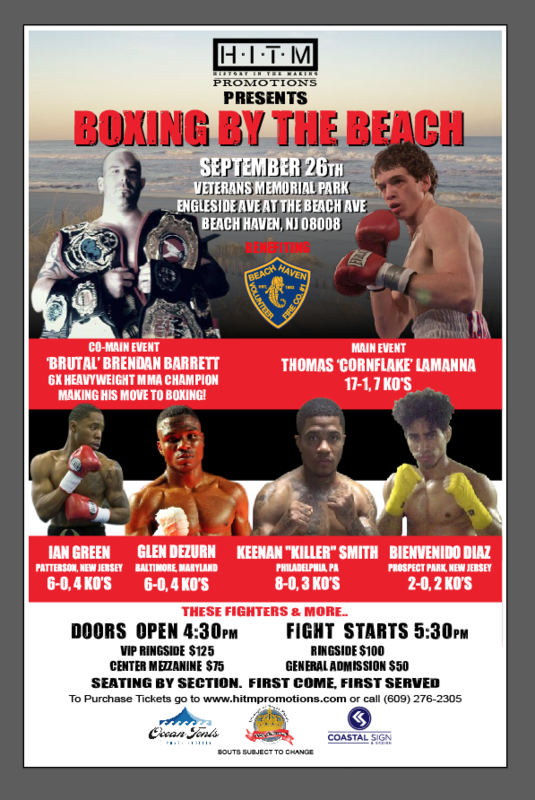 Beach Haven, NJ (September 21, 2015) – HITM Productions, will be presenting their first boxing match, Boxing by the Beach, Saturday, September 26 at The Veteran’s Memorial Park in Beach Haven, LBI, NJ. The event, held under a tent in the park, will go on rain or shine. This inaugural event will showcase some of the greatest talent in boxing from all over the globe. “It is an honor and a pleasure to have such great athletes competing on our first show, and we are very excited to bring boxing to Beach Haven,” shared HITM Productions. Six time Heavyweight MMA Champion “Brutal” Brendan Barrett who will be fighting Satario Holdbrooks in his first boxing match after crossing over from MMA. Dustin “The White Tiger” Fleischer, signed with RocNation, one of the top Welterweight fighters in the US right now, will be taking on Ira Frank just coming off a win in his June 12 bout. Thomas “Cornflake” Lamanna boasting a record of 17 – 1 with 7 KO’s, will be taking on Ayi Bruce, bearer of 15 KO’s for the Middleweight fight that night. Middleweight Ian Green (6 – 0 ) is paired with K Lon Spencer of Texas (4 -2) to see who emerges victor of that bout after 6 rounds. 4 rounds of Light Heavyweight fighting will transpire between Meng Fanlong, Chinese Olympian signed with RocNation, and Michael Mitchell, presently ranked 72 in the US. O’Shanique Foster (7-0) will take on newcomer Darius Jackson for 4 rounds of Lightweight boxing. Sidney Outlaw, also a fellow pro-MMA fighter from will be making his professional boxing debut as well against Angel Concepcion (6-0) in the Light Heavyweight division. Undefeated Arturo Trujillo (6-0) will be taking on NC native Alex Asbury (0-2) for 4 rounds of Middleweight fighting. Doors open at 4:30pm and fights will commence at 5:30pm with famed announcer David Diamante taking to the ring. Tickets can be purchased at www.hitmpromotions.com or at the following retailers: The Chicken or the Egg (Beach Haven), The Ice Cream Shop of Manahawkin or Jon Miller Car Care Center (Tuckerton). Seating is first come first served. Food and beverages will be provided by Shorty’s of Tuckerton. Music for the event will be provided by DJ Marc V, with the help of MK Productions. Sponsors of Boxing by the Beach include: Advantage Vapors, Lombardi Construction Management, GH3 Promotions, The Sea Shell Resort, Defensive Fit, Richard Catena Auto Wholesalers, 597-Taxi, Coastal Sign & Design, Ocean Tents, JDM Andrews, Inc., Point Tees, and Eastern Shore Associates. Ring of Combat 46 called best ROC ever! send me the latest brutal news!